Brian Lynch knows that a trumpet player really needs brass to bring off a quartet date. Without a reed player to share the spotlight, the quartet setting leaves a trumpeter exposed. To meet the challenge, Brian – an alumnus of both Horace Silver’s and Art Blakey’s groups – invokes those towering trumpeters of the late 1950’s and early 1960’s, Lee Morgan and Freddie Hubbard, with a storytelling solo conception that blends technical agility, harmonic ingenuity, and earthy declamation. Brian, who has led quintets and sextets on prior dates, also displays a resourceful composing and arranging style that enables the quartet to evoke the hard-bop legacy and big ensemble sound. From his current work with Eddie Palmieri’s incendiary combo and the venerable Phil Woods Quintet, Brian understands that a great rhythm section is an indispensable ally. To join him in the quartet, Brian fist selected David Hazeltine – a fellow Milwaukeean and bright light on the New York jazz scene – who played on one of Brian’s earlier quintet dates. Dave recently completed his own quartet date featuring Slide Hampton on trombone (Four Flights Up, Sharp Nine Records). With swing and harmonic sophistication, Dave plays piano for Marlena Shaw and for Slide’s Music Masters Big Band. Completing the circle are the fist-call bassist, Peter Washington, who has recorded with both Brian and Dave and has been a fixture in Tommy Flanagan’s trio, and the superb drummer, Louis Hayes, who has worked with Cannonball Adderly, Dexter Gordon, and Oscar Peterson in his long and illustrious career. These accomplished players collaborate on a varied program marked by taste, interaction and intensity. The opener, the standard I’m Getting Sentimental Over You, is taken at a brisk tempo. In a beautifully paced solo that typifies his work throughout the session, Brian alternates modal allusions to the theme with glancing modal passages, culminating in streams of sixteenth notes and a bluesy final phrase. Next up is a pensive Latin tune, Bolero de Sata, which Phil Woods brought to Brian’s attention. Brian’s rich, full sound is evident here in a solo that is at once plaintive and lush. The third track is the first of four Lynch originals. Chippin’ In, the title tune for one of Blakey’s last recordings, is an infectious shuffle punctuated by sprightly stop-time sections and harmonic twists on the bridge. Reminiscent of vintage sessions by the Jazz Messengers (pairing Mogie or Hubcaps on trumpet with their enigmatic, front-line companion, saxophonist Wayne Shorter), this version features masterful soloing from Brian and Dave, who each build tension by alternating complexity and funk. 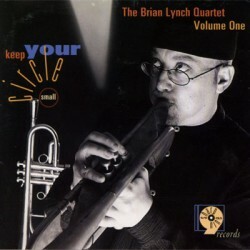 Keep Your Circle Small, the title track and second Lynch original, is an up-tempo line with Brian and Dave sprinting through circular, harmonic patterns like those pioneered by saxophonist Joe Henderson in the 60’s. As a reprise from the original’s rigors, Brian and Dave ease back with a lovely duet exploration of My Old Flame. Brian’s understated approach to the melody illustrates the influence of the late Kenny Dorham. Revisit K.D.’s moving treatments of this tune on his Riverside albums But Beautiful and Jazz Contrasts. After this lyric interlude, intensity returns in Brian’s third original The Trifle, whose title belies a complex structure consisting of a long-meter blues with a four-bar extension. Dave and Brian thrive on the challenge, with Louis Hayes adding an animated solo. After Brian’s fourth and final original, Silent Conversation, a stately waltz, comes a driving version of John Coltrane’s Straight Street. Dig how Louis Hayes fuels Brian’s intense solo with rim shots on two. The program concludes with the quartet swinging on Freddie Hubbard’s Blues for Duane, which Brian plays muted. Peter Washington takes a fleet turn, climaxing with an ascending figure echoed in Dave’s accompaniment. Brian solos incisively, quoting form “Laura” and “Anything Goes” as he pays tribute to one of the trumpet masters. The quartet format presents demands so rigorous that many excellent trumpeters tend to avoid it. One measure of Brian’s inspiration is that this quartet date bears comparison with the efforts of the great hard-bop trumpeters of the 50’s and 60’s. That the quartet also summons the big sound of the Silver and Blakey groups demonstrates Brian’s development not only as a trumpeter but also as a consummate, creative musicians.